Embrace technology to move ahead of your competitors. If you are a company working with several software vendors for creating reviews, ratings and buyer guide, then you need workflow software to manage business processes. This gives a competitive edge over others and improves ROI and business functions for technology keeps on updating for the better. Workflow automation software pulls together every aspect of the business workflow, automating the process and making it simple. The software increases business efficiency as well. Most of the workflow management software includes the functions of customer relationship manager, the job management system, file storage system, dispatch and scheduling system, critical accounts integrations, equipment tracking, and the third-party integrations. All these systems and functions, when combined in software, can improve the productivity of a business and ease the process of the business workflow. Most of the workflow software offers mobile access to contact information, the job files and keep them in your fingertips. Multiple employees can access information even when offline. Choosing the best workflow tool may be hard. They differ from one another to a great extent and adopt a different angle for managing workflow. 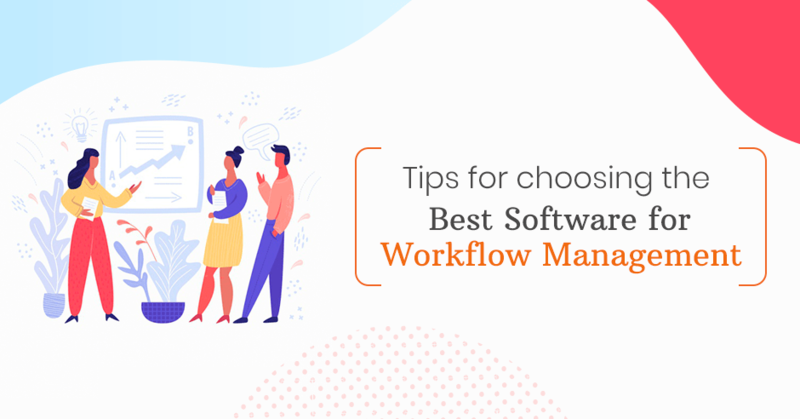 Workflow automation software may be of two kinds: function-based software or the one which informs or allots a responsible person for the given task and another one to replace all manual and paperwork tasks. The software improves workplace productivity and efficiency for they curb all human errors as everything is automated. HR Onboarding and HR Offboarding: The software automates paperwork and so it saves valuable time of the HR personnel. There is no chance of human error here. The benefit of compliance: Workflow managerial tool offers multiple benefits by managing the compliance programs, tracking requirements, scheduling events and also setting alerts. So, employees get to know about the important dates and scheduled tasks. Efficient project management: The workflow software assigns specific projects to the staffs basing on their potential. The software sends alerts, automates tasks and also it tracks statuses. Automate invoicing process: With the workflow management software, you may automate the entire process of invoicing and how the invoices feed into your accounting system. This finally automates budget reconciliation, automates payment and invoice approval. Each industry needs a different kind of process management software. The software automates specific kinds of tasks, and so it is important to choose software which integrates with the solutions and is compatible with it. The workflow managerial solution can automate a variety of tasks across the business processes. It is important to automate business processes to avoid critical human errors. But the question is how to find the best workflow tools for business processes. You need to choose the system which is right and appropriate for you. The need for evaluating the existent system.Before you begin to choose business process management software, you need to classify how everything in the business works. This is the first step for deploying and optimizing workflow management tool. Everyone must be involved in the process of classifying business processes including the stakeholders, subject matter experts, and company managers. Only the team members can offer their insights as to what needs representation in the business process and then identify the best business strategy. The experts also adjust business strategy and thus, meet the changing demand of the organization. As a business, you need to evaluate your system and your needs. What is the workflow challenge like? If you are frustrated with the current workflow, go for the workflow management software. Try and identify your frustrations and pick the specific pain points. Without getting enough information on the problem your organization faces, you can’t identify the solutions needed. This can make it more difficult to choose specific workflow automation software. Choose a solution that your team or staff can use. The answer must be customizable to organizational needs. When you have picked 4-5 software, test them all. Load the entire workflow with the bells and whistles you require. Test software and spend some time. Run 5-6 mocks instances taking different paths to test their efficacy and how far they improve workflow. You also need to know how the workflow management plan operates. For this, you need a comprehensive plan to evaluate performance. After you have identified the problems in your workflow management, it is time to solve them all by considering software offerings. There are different flavours of workflow tools and workflow management software. The design element is the first consideration. There are software programs to allow you to come up with the templates or to build customized web forms. You need to find out how many features of the software can be customized. Look for the features like WYSIWYG Form Designer, Workflow Diagram creation, the feature of dashboard creation, drag and drop interface for creating workflow diagrams. Workflow diagram is an essential feature which showcases the diagram of workflow and how the workflows. Through the workflow diagram, it is easy to trace the needs for efficient workflow. You may again use the software solution for this. The online app may be attached to the software solution or tool. The drag-and-drop interface is the way to create the workflow wizard. It must support various kinds of workflows including the mobile one, standard, social and custom workflow. Find out more about the features of the software and what more can you do with it. You may automate several existing processes like running analytics and reports, initiating process requests, intake project request and launch of projects. Look for complete automation process to make workflow management easy. How much automation or control you want on the workflow processes like accounting, account payable, financial tracking, workflow routing, business notifications, access control, and the ad-hoc procedures, must be considered. Do consider the cloud repository and what you wish to store online. Do you want them to be accessible to only specific people? If you are choosing cloud-based workflow tool, then look for the features like enterprise content management, scalable mobile platform, digital document managerial feature, and automated asset management. There isn’t a particular kind of business process management software to manage the workflow. The efficiency of software is determined by its features like the ability to build apps and being an open source platform. Make sure it is easy to use and may be integrated with several cloud services you need. What is the kind of support the software offers and the number of users should be considered! If you want a business process management software tool, then make sure it features an easy and convenient setup. Most software takes months for setup and to avoid this situation, you may look for cloud-based software. There is no need to waste time on the installation work if you choose cloud-based software. The Cloud-based software solution is best for all kinds of businesses. You should also, consider the price of the software. It should be worth your purchases. Look for intuitive software with drag-and-drop workflow design without any coding needs. If the software is too complicated, your employees will find it difficult to use. Some of the managerial workflow tools are very difficult to use. If the software is complicated, you will burden your employees with technical coding skill. This is again expensive and time-consuming. If the tool is easy to use, no such training will be required. Make sure it supports web-based integration for this is the best way to get the maximum out of the tool. Use it along with other tools and software. So, check the integration capability of the software. There are mainly three kinds of integrations, namely, In-built integration, REST API and integration-as-a-service-provider. It is best to choose IaaS integration for that helps to connect with other SaaS software. So, before choosing workflow tools for your organization, consider the above factors. What matters is usability, installation, integrations, and pricing. Before you commit to any software, make sure your needs are considered. With the workflow management software, you may organize various aspects of the workflow and that too at cost effective rates. It can dramatically improve your business and increase ROI and productivity. Check the demo of the software and then make a choice. How Does a Fingerprint Attendance System Work ? The compact professional attendance management application Empowering businesses with real-time log ins and log outs, TD provides automated solutions at the flick of a button. Available for both iOS and android. Avail every prospective of time management tuned with business needs.